Hello and welcome to “WHO’S ON THE SHELF?” with yours truly, Nonnie Jules! Since we are a book club, you know we had to offer something that included a book shelf. A lot of interviews merely cover an author’s work or an individual’s career stories. Here on this “SHELF,” we get down and dirty and ask the questions no other interviewer dare ask. We ask the questions that you want to open up a book and find the answers to on your favorite authors and fellow book club members, but, no one has dared to cover them. WE get personal! Because when you sit on this “SHELF,” YOU are an open book! Even if I have to pry you open! This entry was posted in Germany, Guest Blogger, Heaven's Pond, History, The Soldier's Return, Writing and tagged #interview, #rrbc, Writing on May 27, 2017 by lauralibricz. Forget the #Oktoberfest, it’s Bergkerwa in #Erlangen! I pass on the Oktoberfest. Who wants to sit in some smelly beer tent in Munich with second-rate German celebrities who compete with each other for the pitiful press coverage? To really experience the German beer-fest-thing, it is advisable to start with the less-commercial fests and work your way down to the smaller, more obscure ones. 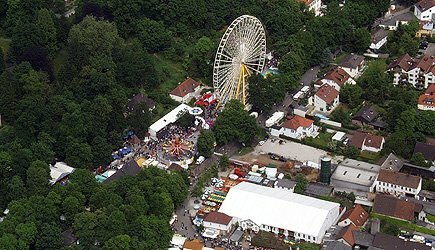 The Erlanger Bergkirchweih is one of the five largest beer fests in Germany. 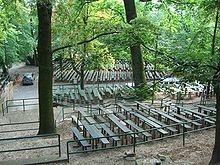 Starting on the Thursday before Pentacost, the fest spans twelve days and marks the so-called ‘Fifth Season’ in Erlangen. 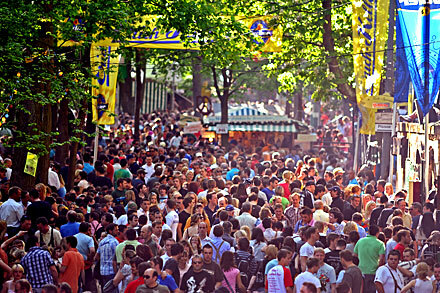 Over a million visitors are expected each year, ten times Erlangen’s population. The Festplatz is on the Burgberg, the hill on the city’s northern side. 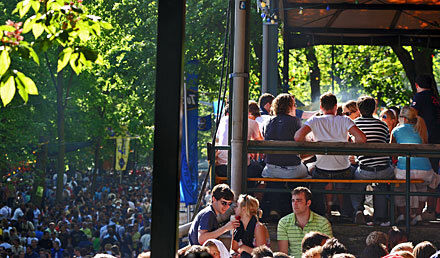 With seating for 11,000 people, it is considered Europe’s biggest beer garden. Bergkerwa or Berch, as it is sometimes called, is the result of a resolution set in place by the city magistrate on April 21, 1755 to revive the Pentacostal market. Beginning on the Pentacostal Tuesday, (today a highly-revered holy day in Erlangen because all the shops and firms and workplaces are closed and everyone is at the Bergkirchweih), the market in the Altstadt lasted three days and soon after incorporated the city’s beer cellars in the sand stone Burgberg, where a cool beer could be enjoyed. This entry was posted in Food and Drink, Germany on May 16, 2017 by lauralibricz. I’m so happy to have Laura Libricz as my guest today. As you can see, I’m encouraging you to linger longer, savouring a cup of espresso from Umbria, Italy and enjoy the lovely roses carefully selected for you by a special little girl! This is Laura’s seventh and final day of her RRBC SPOTLIGHT Author Blog Tour. 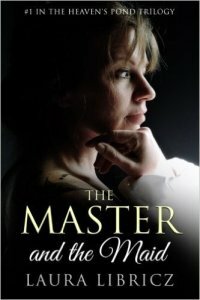 By now, many of you have got to know her better and if you like historical fiction, you’ll definitely be intrigued by her well-researched first book, THE MASTER AND THE MAID which has a setting in 17th century Germany. Please feel free to comment beyond the ABOUT ME section and don’t forget to answer Laura’s question! This entry was posted in Books, Guest Blogger, Writing and tagged #historicalnovel on May 13, 2017 by lauralibricz. I’d like to thank Brenda B. Taylor for hosting me today! Welcome to Day 2 of my #RRBC “SPOTLIGHT” Author Blog Tour. I’d like to thank my host and the RRBC for this great honor. Today I’d like to talk more specifically about writing historical fiction. History is my passion right now and I’d like to share some of the sources I use when I research. Now, judging by the images and the books that are popular today, can you imagine how someone 400 years from now will view our society? How will they reconstruct our day in age based on the records we leave behind? That is, if they can even access our information. What impressions will they have of our culture? This entry was posted in Uncategorized on May 8, 2017 by lauralibricz. With much joy, I introduce Laura Libricz, #RRBC’s “Spotlight” Author! I am thrilled to welcome Laura Libricz, Rave Reviews Book Club “Spotlight” Author, on today’s stop of her blog tour. Laura is an amazing, supportive member of RRBC who generously promotes fellow authors. I consider it an honour to shine the “Spotlight” on her today. With much joy, I introduce Laura Libricz! Welcome to Day 1 of my #RRBC “SPOTLIGHT” Author Blog Tour. I’d like to thank my host and the RRBC for this great honor. To kick off this blog tour, I’d like to talk about writing! This entry was posted in Books, Germany, Heaven's Pond, History, Writing and tagged #historicalfiction, #rrbc, History, Writing on May 7, 2017 by lauralibricz.